We have been traveling as a family in our Airstream trailer since we bought it in 2008. In the beginning, we decided we were going to use the trailer as a way to take longer adventures together as family. Our weeklong adventures ignited a sense of wanderlust that we did not realize was so strong within us. We then decided to take a four-month cross-country trip from California to Florida to quench our growing wanderlust thirst, but the quench never happened. Instead, our wanderlust only grew stronger – and stronger. In 2010, we decided that our Airstream trailer felt more like home than the sticks-and-bricks house we owned back in Ventura, California. With the ability to work remotely, we decided the trailer would be our home and the road would be our backyard. We never set out with any specific traveling goals, but the longer we traveled, the more states we explored. Before we knew it, all of us had 48 states under our belts, including our two-year-old, who has been living on the road full-time since the age of three months. 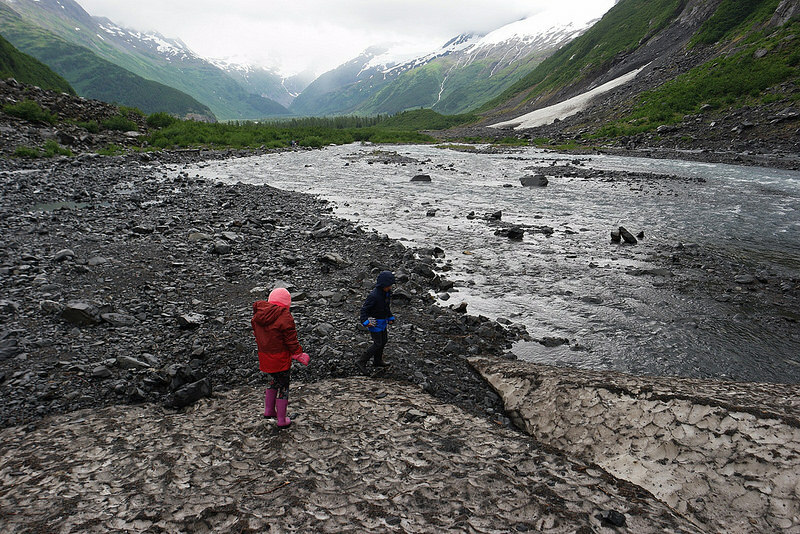 We set a goal to visit the northernmost state this summer, and that's where we are currently adventuring – in the breathtaking state of Alaska. 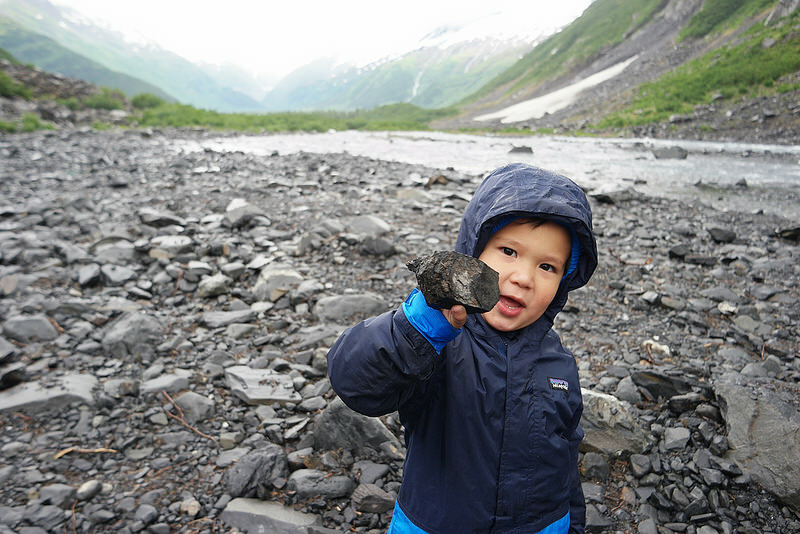 When we thought of Alaska, we envisioned majestic mountaintops and glacier-filled valleys. 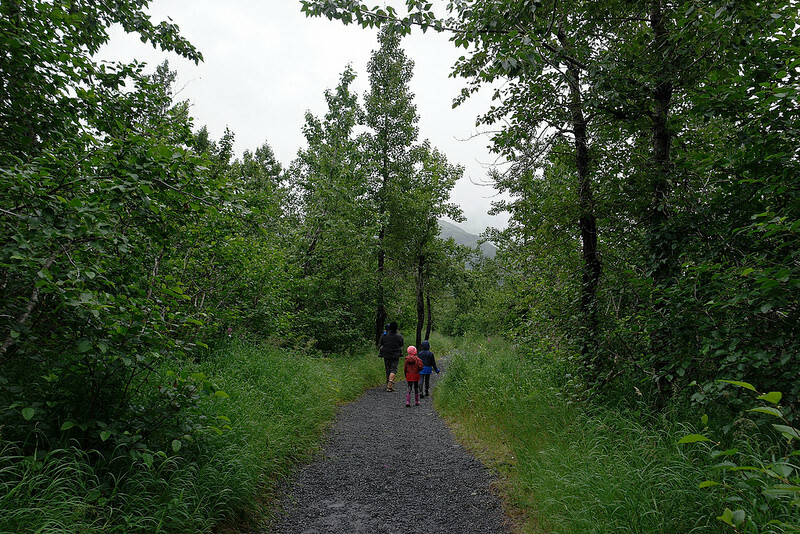 When we came upon the national forest visitor's center in Portage, Alaska, located near the campground where we're staying, we went inside to gather a bit more information on our exploration options. 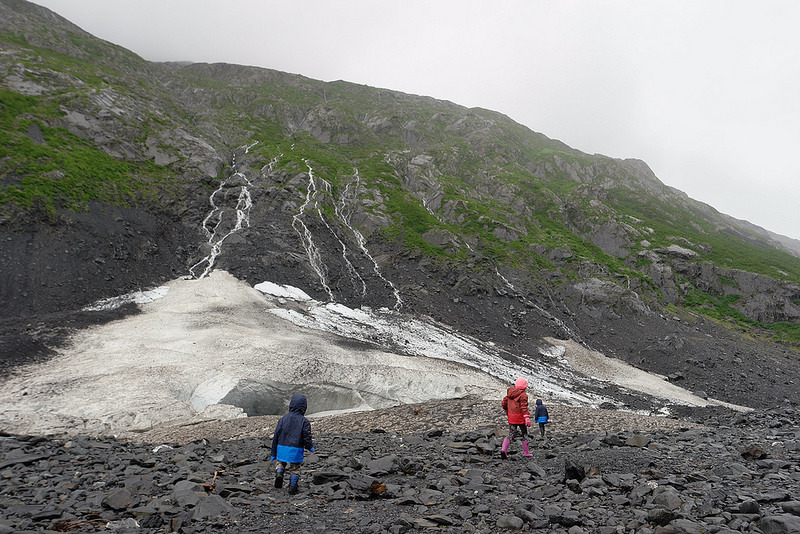 By talking to a ranger, we found out which glaciers were accessible and can accommodate families with children. 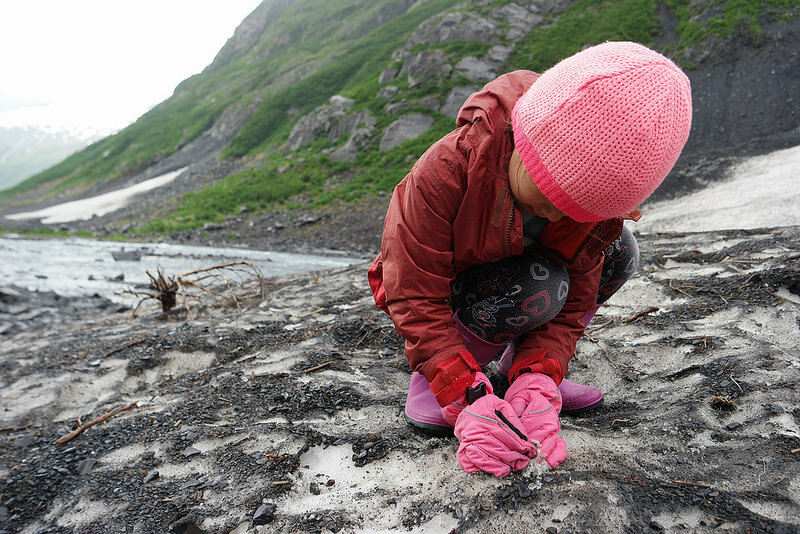 We spend most of our lives outdoors, but it doesn't make us (or our kids) expert hikers. We know our limits, and right now a two-mile trail is a comfortable limit that gives us the best chance of a positive experience. Our eight-year-old doesn't have any issues with this distance. Our three-year-old can handle about a mile without wanting a boost in the baby carrier. 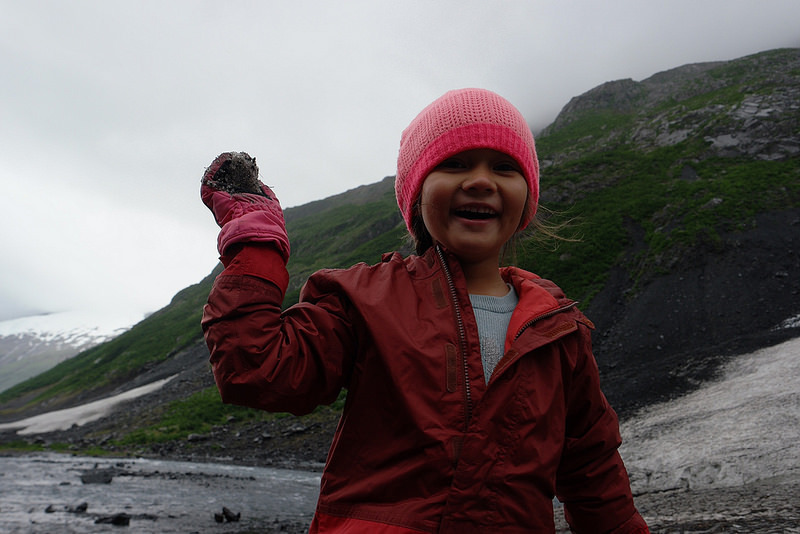 And our five-year-old can whine a bit, so a shorter hike with a big reward at the end is a huge plus for all involved. 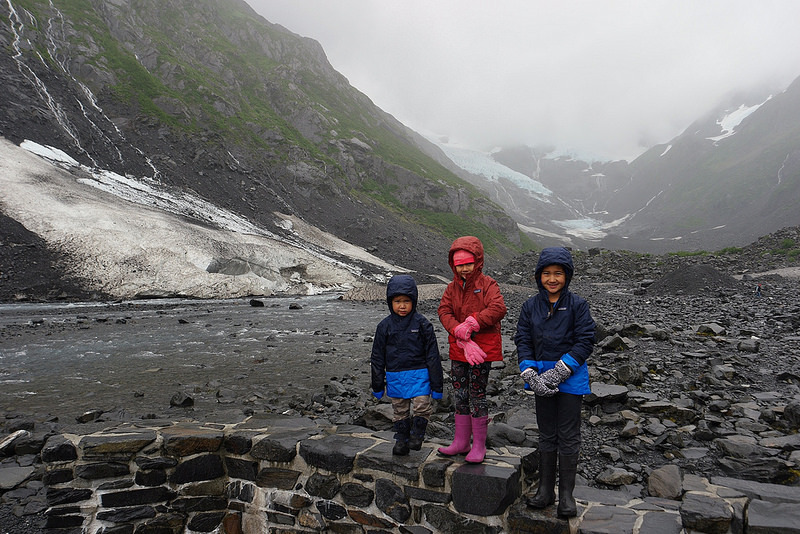 Our chosen hike ended up being a super family-friendly, 1.4-mile hike on a well-maintained, flat trail with an incredible view of Byron Glacier. With water bottles and bear sprays in hand, we were off! During our short stop at the visitor's center, we educated ourselves a bit on the flora and fauna of the area. 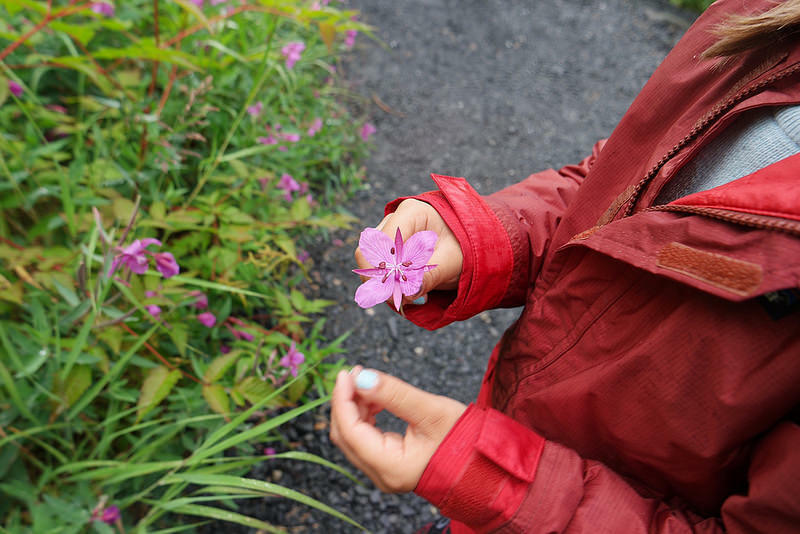 To pass time on the trail, we identified wildflowers that were in bloom. 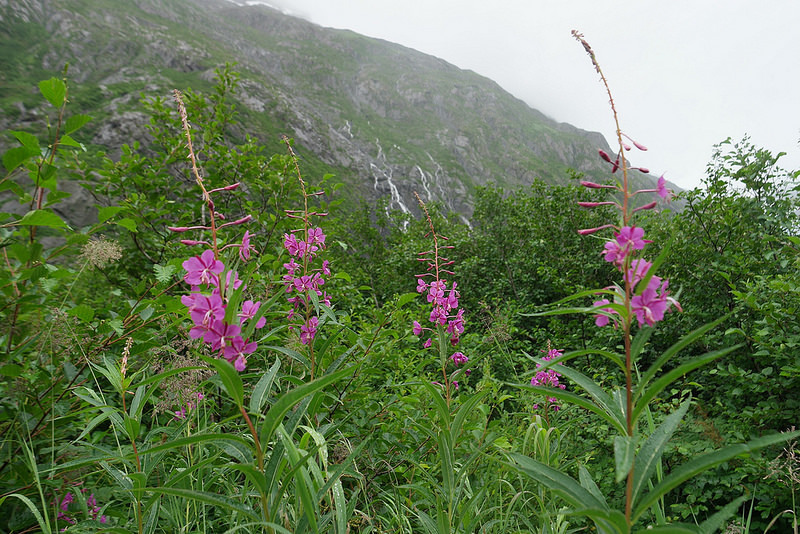 The most abundant wildflower on the trail was fireweed. Locals told us that that they determine the length of summer based on which flowers on the pistil are blooming. If the fireweed has bloomed halfway up, summer is still alive and kicking. 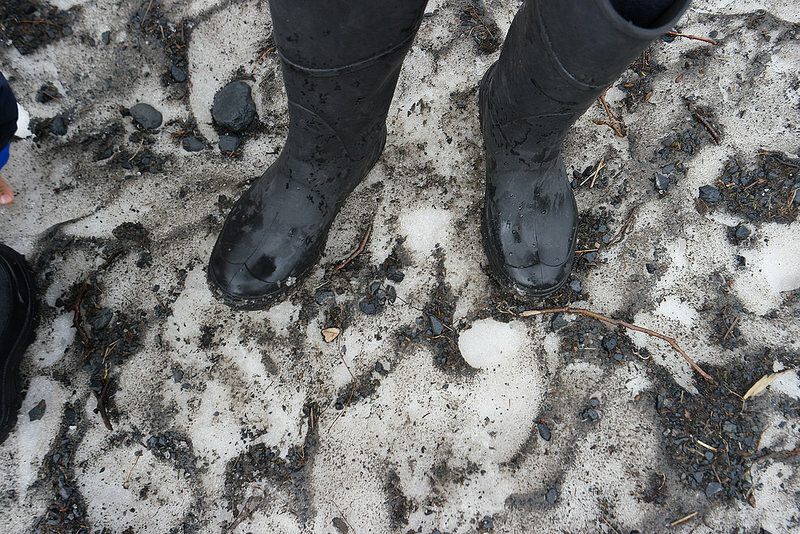 Once the fireweed blooms are spent, fall is approaching and it's time to prepare for winter. 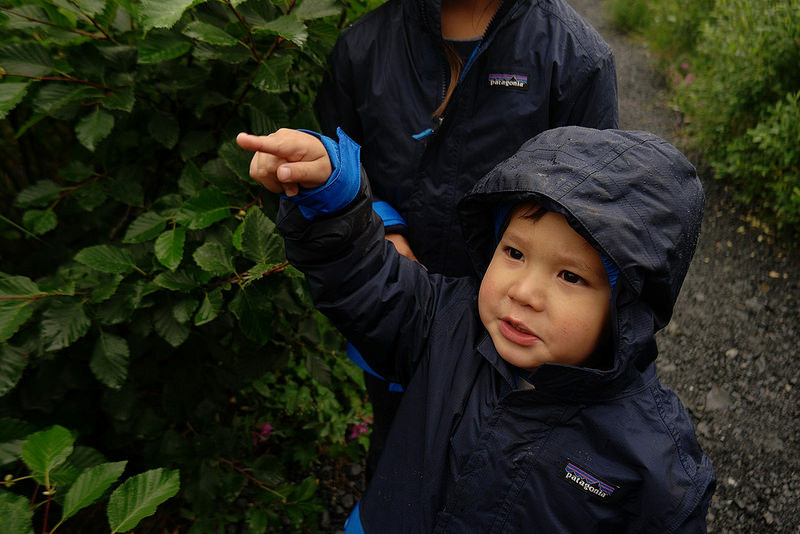 The kids had a blast trying to determine how much summer we had left in Alaska before we had to head south for warmer weather. 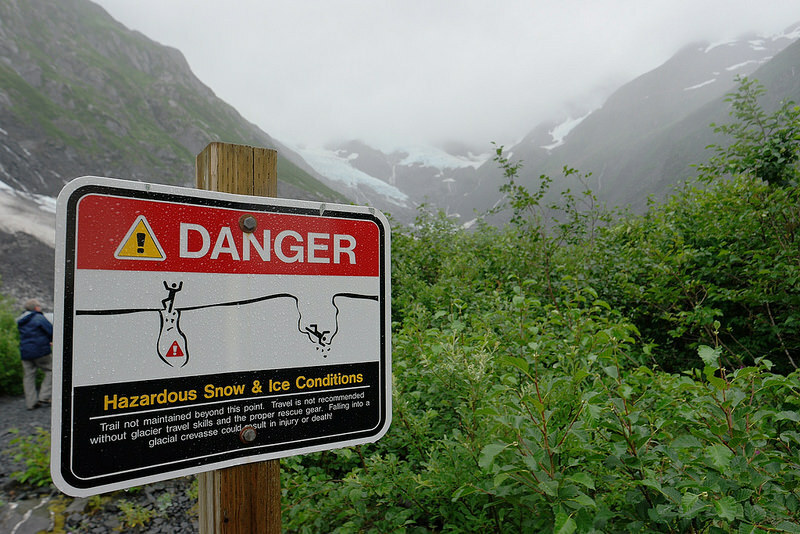 As we approached the end of the maintained path, we ran into this warning sign. 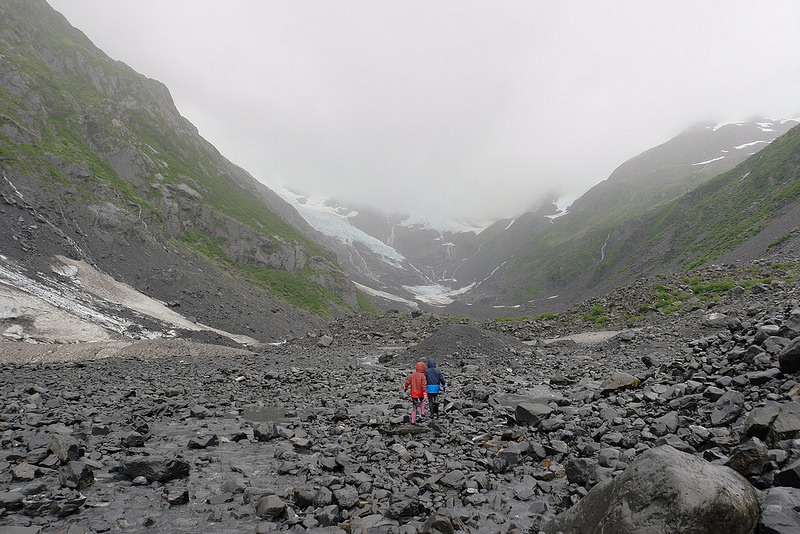 It was probably best to keep off of the glacier itself, but we were far from finished with our explorations. There was still plenty of solid ground from this sign to the foot of the ice. Wild and free is how they'd rather be. We let them roam the area to see what they'd be drawn to on our hike. 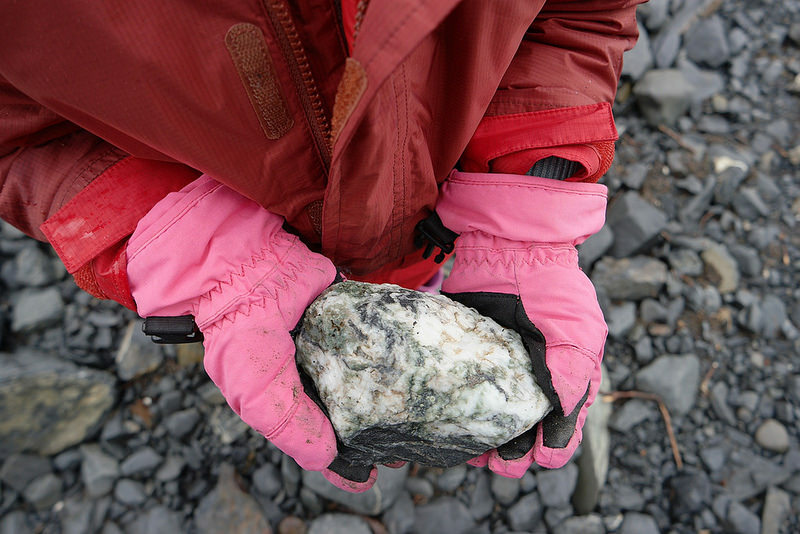 "Look at the cool pattern in this rock!" they screamed. Whatever his older sisters do, this little one does too. 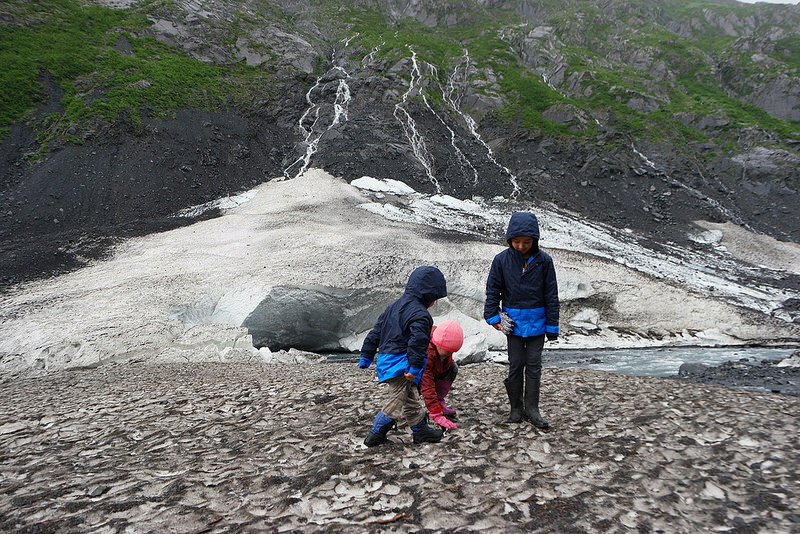 Within a minute, the kids were standing on a smaller patch of ice and were naturally drawn to the cold beneath their feet. 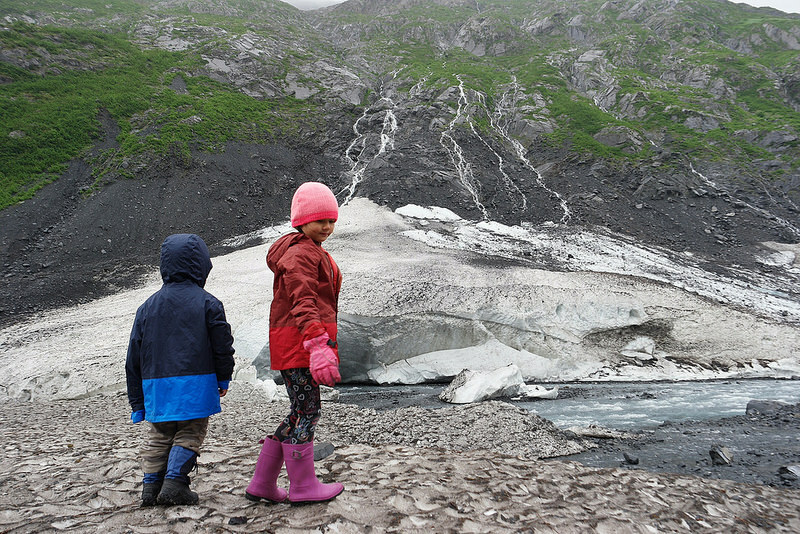 Glaciers are piles of ice that do not melt in the summer, and become slow-moving rivers of ice. It's hard for the kids to connect with those words from the books we read. There is something magical that happens when we get to combine those words with something tangible. The learning gets embedded so much deeper when we take the time to bring the lessons full circle. We didn't grow up in cold climates and we get to avoid them since our home has wheels. 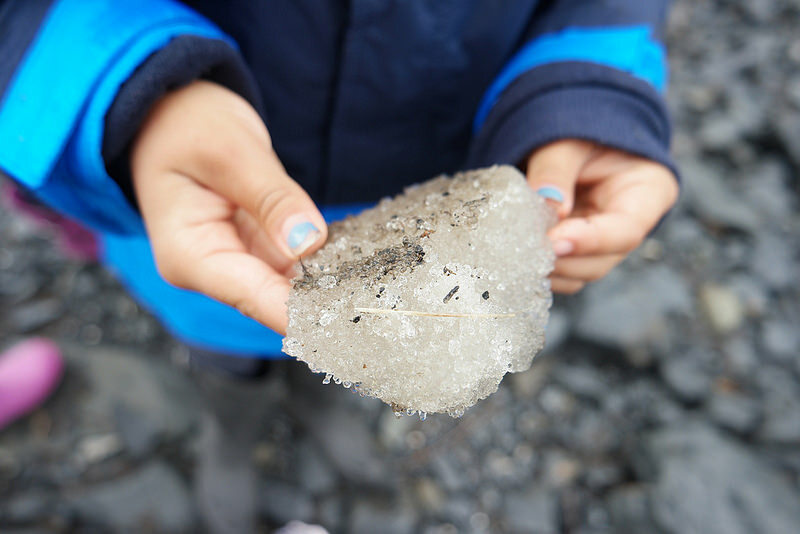 All the ice and snow in our current surroundings are special treats for the kids. Uh-oh. Not sure if I like where this is going! 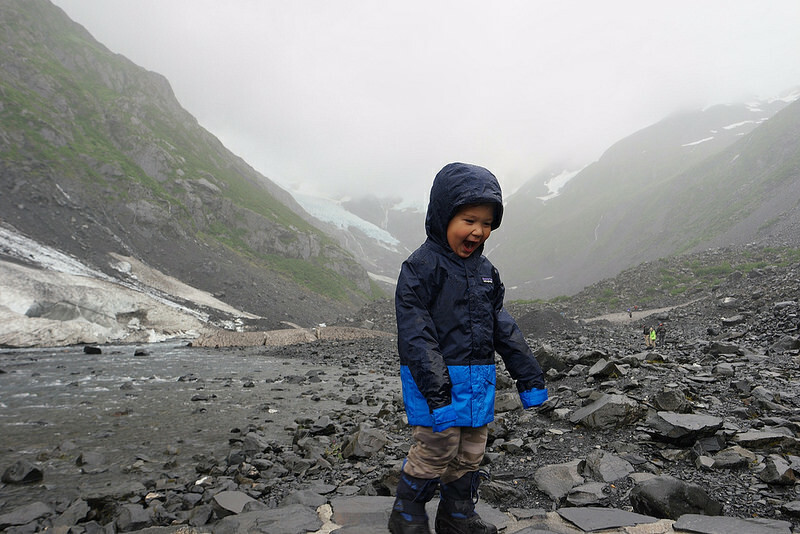 "All this water is coming from the glacier in front us?" they ask. "Yes," we answer, confirming it with a quick dip of our fingers. Brrrrr. 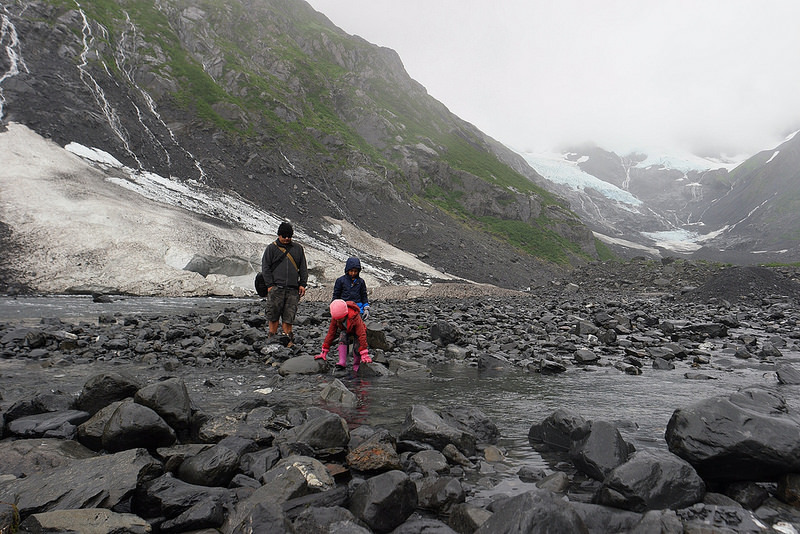 Instead of leading the way for the kids, they got to lead the parents back to the trail, choosing to cross the frigid stream of glacial runoff instead of climbing over the damp rocks. 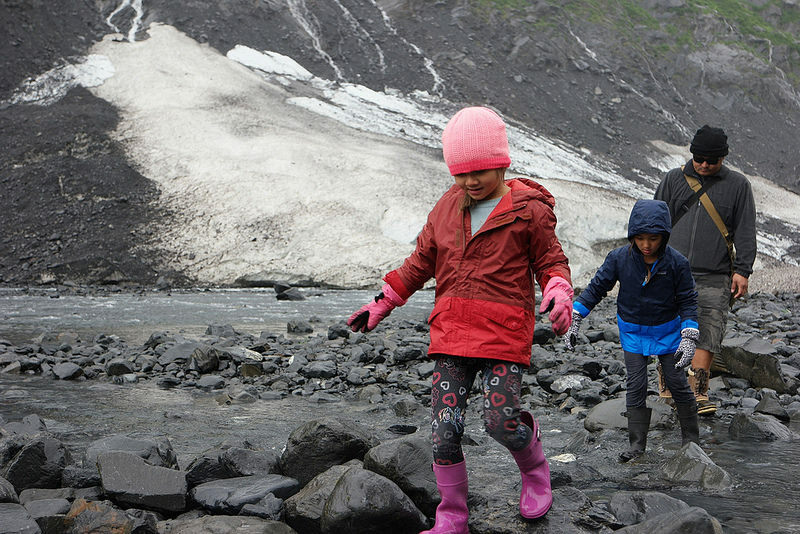 I'm not sure if they will remember the intimate details of the day here at Byron Glacier, but I know the sense of adventure will be seared in their hearts, knowing that we all got explore together as a family. And that's all that matters.